This feature is part of The Sprawl's Alberta Election Edition. Become a Sprawl member today and support independent, ad-free Calgary journalism! It’s been mere months since an international consortium of scientists announced that we have just over a decade to push for meaningful climate action before it’s too late. Given this warning, you’d think climate policies would be front and centre in every election from here on out—but we’re not seeing that in Alberta. 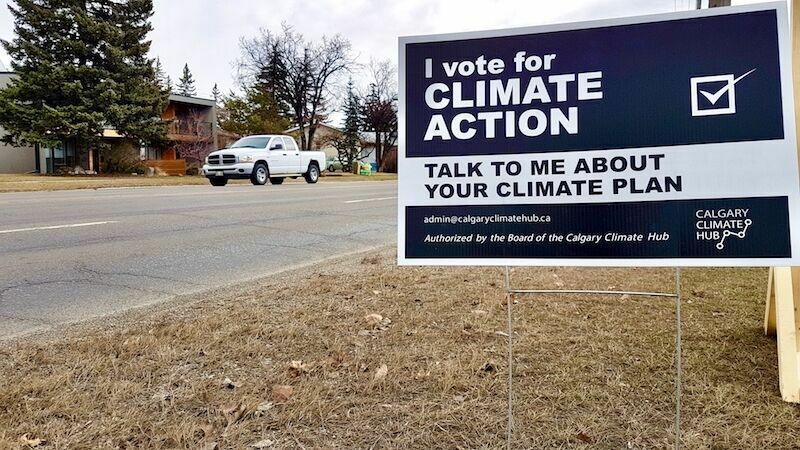 The Alberta Party and the Freedom Conservative Party don’t even name “climate change” in their platforms. Meanwhile the United Conservative Party (UCP) is seeking to roll back many of the NDP’s advances made in the last four years. Let's take a closer look at how the different platforms stack up against each another. The United Conservative Party (UCP) proposes eliminating the carbon tax and returning to a model of taxing pollution similar to former Premier Ed Stelmach's in 2007, wherein only large industrial emitters have any price on emissions. That change would also come with a lower rate, dropping from $30 per tonne (introduced by the NDP) to $20. Furthermore, that rate would exempt the majority of each company’s emissions, measuring against what they emitted in 2016 and forcing them only to compete against their historical emissions. In contrast, the NDP plan set sector-wide benchmarks so dirtier companies had incentive to clean up their production. Andrew Leach, associate professor of environmental and energy economics and the University of Alberta, says there's good reason the NDP didn’t focus solely on industrial emitters. 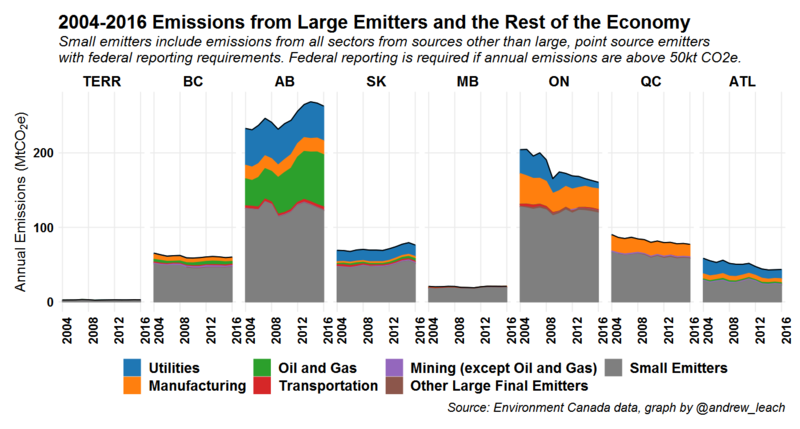 If you’re going to have a policy that focuses exclusively on [large industrial emitters], you’re sort of inviting a policy that’s discriminatory against your province. Leach chaired the Climate Leadership Panel, conducting the research on which the Notley plan was based. Certainly Leach isn’t alone in his objections. Dale Beugin, executive director of Canada’s Ecofiscal Commission, says the proposed UCP policy is less effective. “You want to make that carbon price as broad as possible to produce any given level of emissions reductions at the lowest cost,” Beugin said. Leach also notes that if Alberta advocates for industrial-emitters-only policy, Alberta ends up with the short straw. The Alberta Party has promised a similar model to the UCP in their iteration of a carbon tax—exempting homes, businesses, farms, and nonprofits. Beugin says these exemptions run contrary to best practices in other jurisdictions such as B.C. Even at $30 per tonne, they saw lower consumption of gasoline, natural gas and so on. As for the NDP, there isn’t much new in their platform since their Climate Leadership Plan (CLP) was meant to cover over a decade of policy. They remain committed to returning the bulk of their carbon tax revenues to low- and middle-income Albertans in the form of rebates. The NDP platform lauds the success of their CLP, claiming emissions have dropped by 16% since the plan was implemented—but in reality, the 16% is how much emissions are expected to drop from what was originally projected by 2030. The most recent CLP progress report, released in February, cites 2016 statistics that show the government tracked only a 2% decrease in CO2 equivalent emissions from 2014. The Liberal Party says they will keep a carbon tax but make it revenue neutral, meaning they would enhance rebates to low-income Albertans. The Green Party is more aggressive, stating they would raise the rate of the carbon tax. The Freedom Conservatives vow to eliminate any carbon tax at all and join the legal battle against the federal policy. If the NDP form another government, it would mean the continued existence of Energy Efficiency Alberta, a new agency that administers rebates for efficiency projects and encourages energy-saving home upgrades. The NDP also renewed their pledge to fund the new Calgary and Edmonton LRT projects, which the UCP and Liberals have also committed to. The Green Party goes further, saying they'd support additional transit investment to take even more cars off the road. Coal is another big issue. Both federally and provincially, under the NDP, a phase-out of coal is scheduled to happen by 2030. The UCP and the Freedom Conservatives both want to reverse that decision. How they would address that conflict with Ottawa is unclear. To experts’ chagrin, the idea of supporting carbon capture and storage technology has resurfaced in the election, advanced by the UCP. Those historical subsidies for carbon capture and storage have just been really expensive. Another problem in Alberta is methane gas, mainly produced by the energy sector. Methane is of particular concern as it has a warming effect roughly 25 times that of carbon dioxide. The NDP are reiterating their commitment to lower methane emissions by 2025, but thus far little progress has been made. The Green Party proposes more creative and aggressive solutions, such as electric vehicle subsidies and a net-zero standard requirements for buildings constructed after 2030. Alberta politicians know victory is all but impossible in this province without supporting the province’s biggest industry, as was demonstrated in the leaders’ debate earlier this month wherein all of the leaders disputed how to get pipelines built—but not whether or not building more pipelines is sound environmental policy. And so by that measure all parties in Alberta are falling short on climate action as all parties—with the exception of the Greens—have supported one or more pipeline projects. UCP leader Jason Kenney also proposes a “war room” to “respond in real time to lies and myths” about Alberta’s energy sector. It’s estimated this endeavour will cost a cool $30 million. We need our government to send the message that they’re watching over industry and making sure industry behaves well. This isn’t Kenney’s brainchild, Leach notes. Similar communications strategies were pursued both by Stelmach and federally under former finance minister Joe Oliver. Leach suspects these strategies actually helped fuel some of the anti-Alberta sentiment outside the province. The NDP set the goal of deriving 30% of the province’s power from renewables by 2030. Contracts signed by the NDP under the Renewable Electricity Program guarantee producers a price of $37 to $40/megawatt hour for wind, or $48/megawatt hour for solar. To put that in context, the average cost in the province of natural gas electricity using the lowest-cost technology (before a carbon tax is factored in) is $54 per megawatt hour, according to the Canadian Energy Research Institute. Despite this success, both the UCP and the Freedom Conservative Party have said they will end subsidies for the renewables industry—but continued support might not be so crucial at this juncture, says Leach. “It’s not just the government that should be interested in procuring power at $30,” Leach said. “This isn’t a technology that needs massive subsidies to succeed. It needs still some contract stuff to take some risk off the big capital [investment] up front." Meanwhile, the Liberal Party is vague about their support, only stating that they will create a regulatory environment to support renewables. The Alberta Party is mum on the topic. And once again, the Green Party is the most strong-spoken in their support for renewables, especially solar and geothermal. Earlier this month, a federal government report was leaked to CBC stating that Canada is warming at nearly three times the global rate. In light of this revelation, it's jarring to see only three parties address climate change adaptation. After sending mixed messages earlier in the campaign, the UCP have committed to supporting the Springbank Dam, one of the NDP's planned flood mitigation projects. 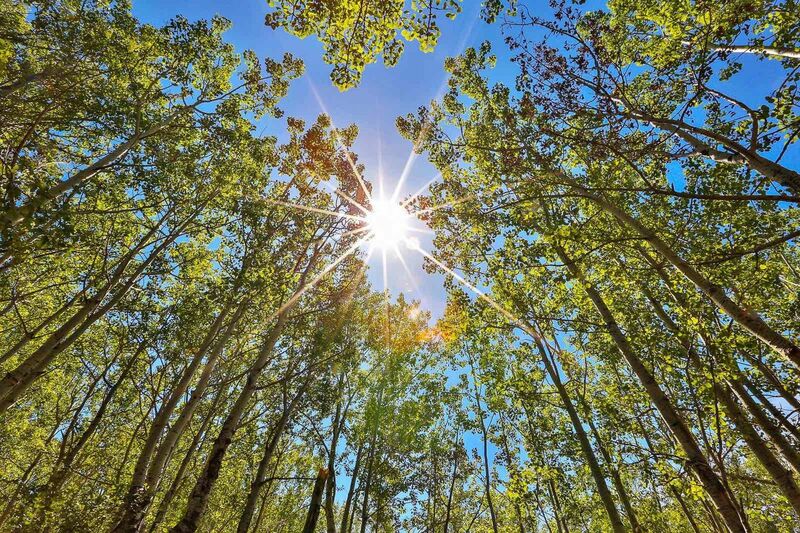 Both of those parties have also stated that they will combat the spreading problem of pests such as the mountain pine beetle in Alberta’s forests. Additionally, the NDP commits to improving watershed management to combat the growing problem of blue-green algae blooms. But that's all that is outlined by the two main parties. Again, the Green Party is bolder. It would mandate a review of water licences every 20 years, in light of worsening droughts due to climate change. “The stringency of the policies that are on the table are not going to be sufficient to get where we want to go,” Beugin said. “So more is going to be required over time."